View More In Hunting Dog Equipment. 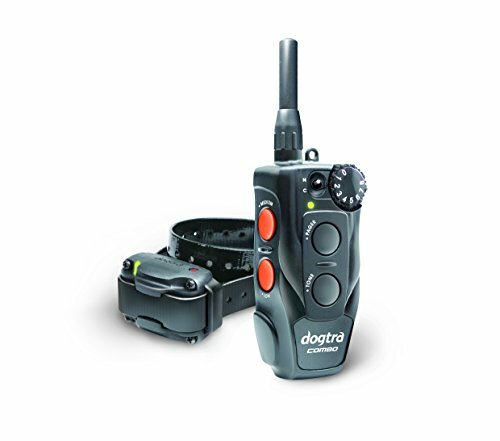 Built to capture every moment with your dog, the Dogtra COMBO e-collar gives you the immediate and accurate stimulation control by our unique combination boost control system and advanced one-handed operation handheld transmitter. Designed for dogs as small as 10 pounds, the Dogtra COMBO is an intuitive and durable remote training tool- a great e-collar for pet training, hunting dogs, police K9 professionals, and serious amateurs. The versatile Dogtra COMBO e-collar outputs low-mid stimulation in 1/2-mile range with the unique features necessary for professional e-collar trainers. The Dogtra COMBO has 8 stimulation levels and is paired with the combination boost control system that gives 3 levels of instant boost per stimulation level. The front facing selector step dial and intuitively placed stimulation and non-stimulation input buttons on the functionally designed Ergo dynamic handheld transmitter provides the 'no-look' control, letting you focus more on your dog. If you have any questions about this product by Dogtra, contact us by completing and submitting the form below. If you are looking for a specif part number, please include it with your message.